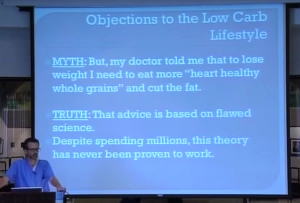 “My doctors tell me I need to eat heart-healthy whole grains,” that’s just based on flawed science. And the flawed science is this: they studied those hunter-gatherers who didn’t have any of the diseases of civilization and they said “Look, they eat more fiber so you need to eat more fiber. Since you eat a lot of bread, you need to eat whole wheat bread.” But the hunter-gatherers, they got their fiber from nuts, vegetables and fruits. 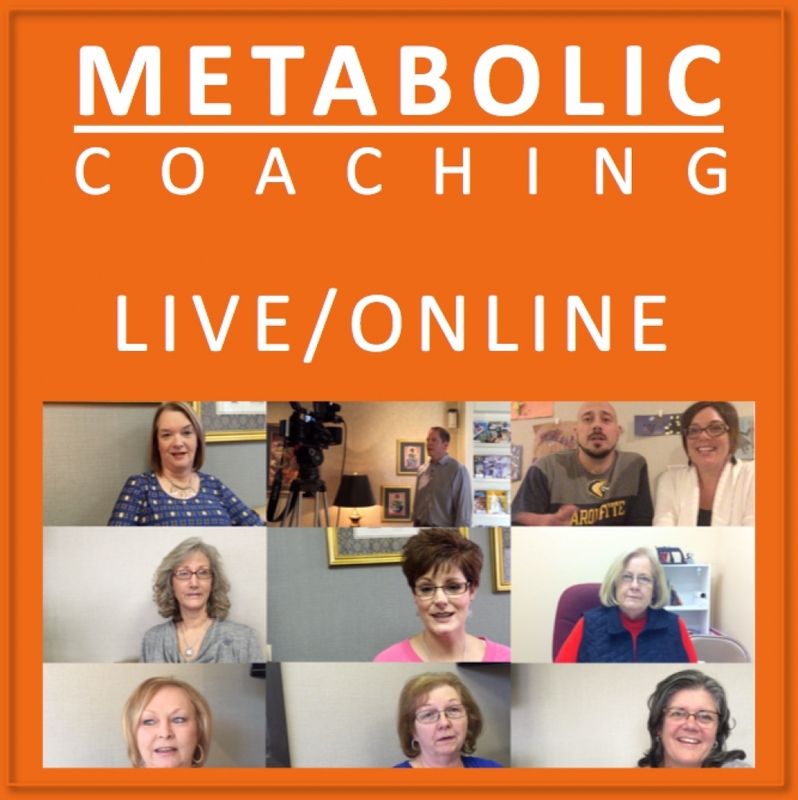 “If I cut the carbs I won’t have any energy.” Once you liberate your fat cells and let your fat cells dump energy into your body like they were designed to do, you’ll have more energy. If you get rid of the carbs, you may feel a little tired, a little lethargic, a little foggy headed for three or four days, but then you’ll have energy again like whenyou were a child – energy that you thought you’d lost. here, there, wherever. It’s actually a blessing because that fat can really make you feel great. As long as insulin is present, none of the energy can get out of your fat cells. But as soon as you stop eating the carbs and you stop the insulin, finally, maybe for the first time in your life, your fat tissue can do its job – and that is provide energy to your body. Just release all that energy out of that fat tissue and the fat tissue shrinks while it’s doing it – just release that energy out, it’ll make you feel great. And that’s why people who eat low carb diets, they feel great, they feel much better even before they reach their goal weight. That’s what your fat tissue was intended to do. There’s a myth that Dr. Atkins died of a heart attack, and he was obese when he died. The truth is that Dr. Atkins slipped on the ice and he got a hemorrhage in his skull, he was in ICU for two weeks and died of multiple organ failure. He had multiple organ failure and when you’re in the ICU, they pump you full of fluids to try and keep your circulation going. Also, your kidneys aren’t working so you’re not getting rid of any urine, so you swell up. And so when he died he was really big – swollen full of fluid. And he did have heart disease. He had a heart disease called viral cardiomyopathy, which means an infection from a virus. And when he was diagnosed with viral cardiomyopathy, that infection from a virus, they did a coronary angiogram and checked his heart and it didn’t have any blockages in it. For instance, let’s say your car had a hole in the oil pan and all the oil had leaked out of your car. I do not recommend that you turn the key and start your car and drive it. Now the fact that I don’t recommend it, doesn’t mean that if you start your car then the oil is all gonna leak out of the oil pan. It means if you start your car, it’s too strenuous for your car. And your car will burn up. But the starting of the car doesn’t actually cause the leak in the oil pan. There are people who are albinos. Albinos don’t have any skin pigment at all. I don’t recommend they stand out in the sun. But does that mean that standing out in the sun causes them to become albinos? No. 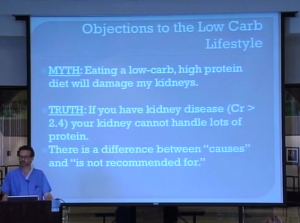 In just the same way, eating a low carb high protein diet doesn’t cause kidney failure, but it’s not recommended for people who are in kidney failure. There’s a myth that it’s too expensive. Two things: number one, when you eat less carbs, you’re gonna eat less often. And number two, lots of low carb high protein foods, you’re already eating. You just gotta take the buns off. If you take the buns off you turn a high carb food into a low carb food. 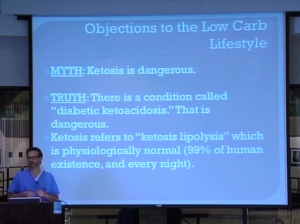 There’s a myth that ketosis is dangerous. And that comes from a condition called diabetic ketoacidosis. People who have diabetes can have diabetic ketoacidosis — that is dangerous. 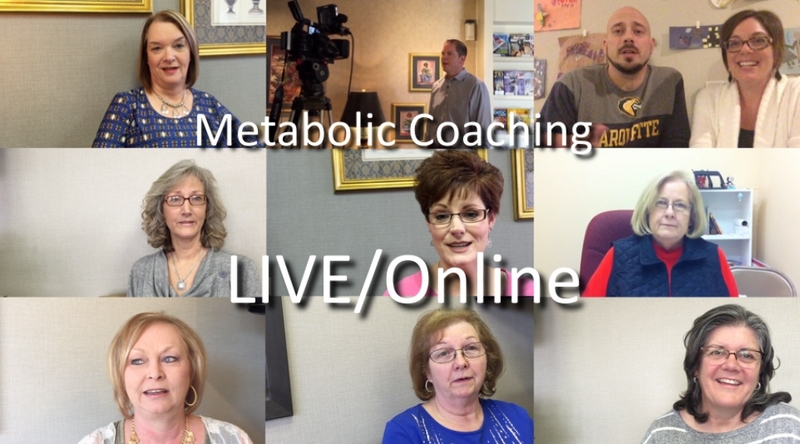 Their ketones go up to 200. Ketosis, which is normal fat burning metabolism – when you’re in your normal fat burning metabolism your ketones go up to 4 or 5, not 200.